Stewarts Law specialise in catastrophic personal injury work and as part of our series taking you through the process of claiming compensation, we wanted to share with you recent success in securing damages to fund exoskeletons for suitable clients. We recently acted on behalf of a serviceman in the case of Dale Messenger v Ministry of Defence. Our client suffered serious spinal injuries in October 2009 during a live ammunition training exercise in the Falkland Islands. During the exercise, Dale was accidentally shot by another soldier with the bullet passing through his right hip and out of his left hip. As a result of the shooting, Dale was left paralysed and is wheelchair dependent. Stewarts Law pursued a claim against the Ministry of Defence and liability was admitted in full, with the level of compensation agreed in September 2014. Dale Messenger recovered 100% damages including damages in excess of £550,000 to cover the cost of an Ekso exoskeleton. The costs for the exoskeleton covered the walking frame with replacements and its associated costs over the course of Dale’s lifetime. According to Ekso Bionics who manufactures the Ekso suits, this was the first known recovery of damages in England and Wales for this type of equipment. When thinking of bionic exoskeleton suits, futuristic robotic uses often primarily spring to mind. The term ‘exoskeleton’ has its source in nature, referring to the outer skeleton that some animals have to support and protect them. Exoskeletons were primarily developed for military uses. They are used to provide protection, and give servicemen the ability to bear huge weights, in the field and in rescue operations to recover victims without significantly moving them. BBC News has reported on the ‘rise of the exoskeletons’ which explores how the suits are becoming ever more sophisticated with technological advances. Crucially, exoskeletons are becoming commonplace in patient rehabilitation. This is one of the most exciting areas of development in the field of spinal injury and one that Stewarts Law takes a keen interest in. The devices are aimed at getting the spinally injured back on their feet and walking again. 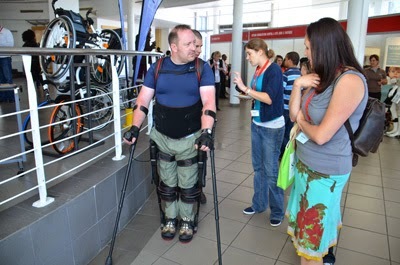 The Ekso exoskeleton allows Dale to pursue therapeutic walking. We have seen first-hand that this makes a huge difference to our clients. Whilst offering the various positive physical benefits that one might expect, walking in the Ekso resulted in significant pain relief for Dale. Dale, who is also an Ambassador for Ekso Bionics, travels the world demonstrating the Ekso. This is a field which is rapidly progressing and we expect to see more claims that secure people access to exoskeletons. Read more about our work with SIA here. Ben Rogers, a Partner at Stewarts Law, represented Dale Messenger and advises on all aspects of catastrophic injury, with particular expertise in spinal cord, brain, complex orthopaedic and amputee injuries.